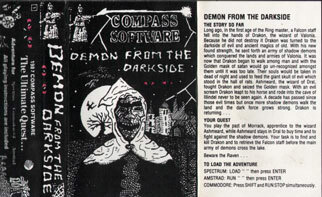 Compass seems to have been a one-man operation by Jon R. Lemmon. For more information, see Zenobi Software. Type: Text only Written 1986 by Jon R. Lemmon. Notes: Sequel to "Blood Of Bogmole". Type: Text only Written 1992 by Jon R. Lemmon in PAW. Type: Bitmap graphics Written 1986 by Jon R. Lemmon in PAW. Type: Text only Written 1986 by Jon R. Lemmon in PAW. Notes: Blood of Bogmole part 3. Type: Drawn graphics Written 1986 by Jon R. Lemmon in The Quill. Comments: Followed up by "Golden Mask", "Devil's Hand" and "Shadows of the Past". Type: Drawn graphics Written 1987 by Jon R. Lemmon in The Quill. Type: Drawn graphics Written by Jon R. Lemmon in The Quill. Type: Text only Written by Jon R. Lemmon in PAW. Type: Text only Written 1989 by Jon R. Lemmon in PAW. 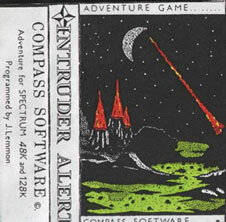 Type: Drawn graphics Written 1989 by Jon R. Lemmon in PAW. Type: Drawn graphics Written by Jon R. Lemmon in PAW. Type: Text only Written 1993 by Jon R. Lemmon in PAW. 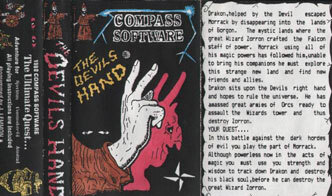 Notes: A compilation of "Project X: Micro Man", "The 'O'Zone", "Demon from the Darkside", "The Golden Mask" and "The Devil's Hand" released on a 3.5" +D disk. Notes: A compilation of "Shadows of the Past", "The Hobble Hunter", "Project-X: Micro Man 3: Micro Mutant", "Intruder Alert" and "Invaders from Planet X" released on a 3.5" +D disk. Written 1985 by Jon R. Lemmon. Written 1986 by Jon R. Lemmon. Written 1991 by Jon R. Lemmon.